As Erik has announced on Facebook and Twitter a few days ago, Chris Eliopoulos — long-time letterer of Savage Dragon — is leaving the book… once again. 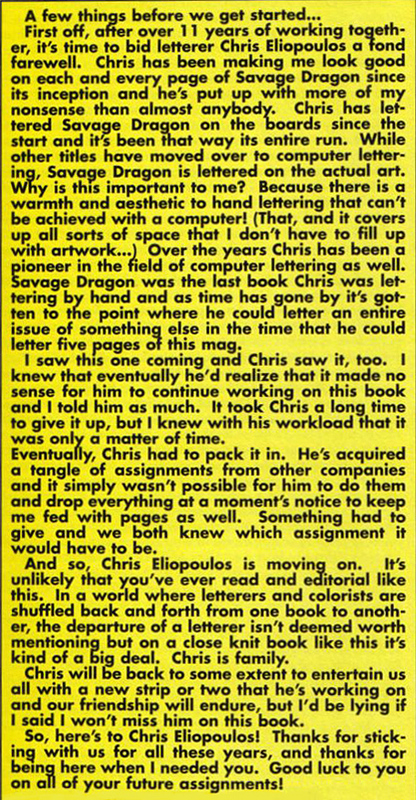 Chris initially started working on Savage Dragon with the original mini-series and stayed onboard ’til issue #106. Up to that point, he had hand-lettered everything onto the original art-boards — from speech bubbles to thought balloons and even all those amazing sound effects. Following Chris’ departure, Erik worked with John Workman, who took over from Chris and later Tom Orzechowski. At one point Erik even lettered the book himself, but it took up too much of his time and the results weren’t what Erik was aiming for. Eventually, Erik decided that hand lettering just took up too much time. He had to mail the original art to the letterer and then wait for them to do their thing and mail the pages back. 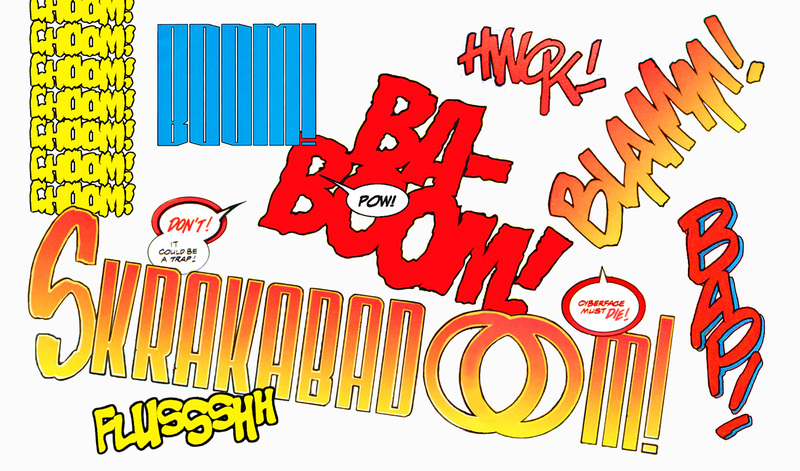 So, reluctantly, after 21 years of hand-lettering, he agreed to turn to digital lettering. On the plus side, that meant that Erik could work with Chris again! Chris came back with Savage Dragon #186 and worked his magic using a font based on his own hand-lettering. Lettering isn’t Chris’ only profession. 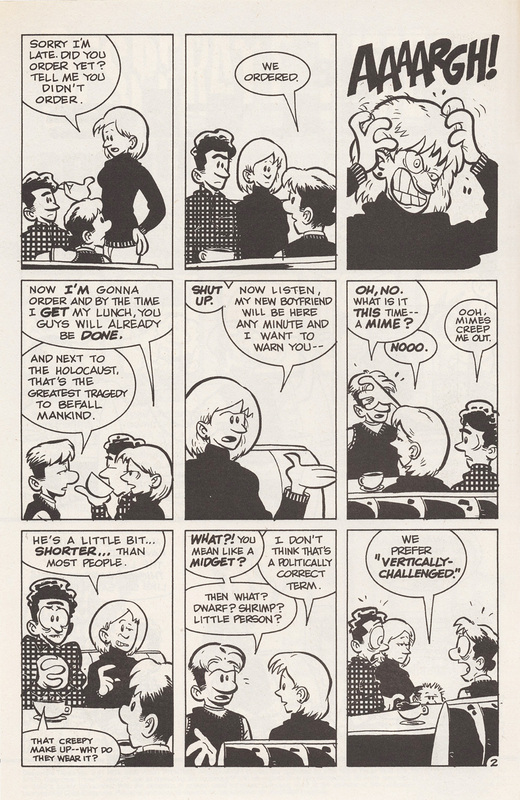 He’s a talented cartoonist and writer himself and has made a name for himself over the years. He is known for his work on books such as Marvels “Franklin Richards – Son of a genius”, his web comic “Misery Loves Sherman” and the comic strip “Desperate Times” which ran as a backup feature in Savage Dragon and was later released at Image Comics. 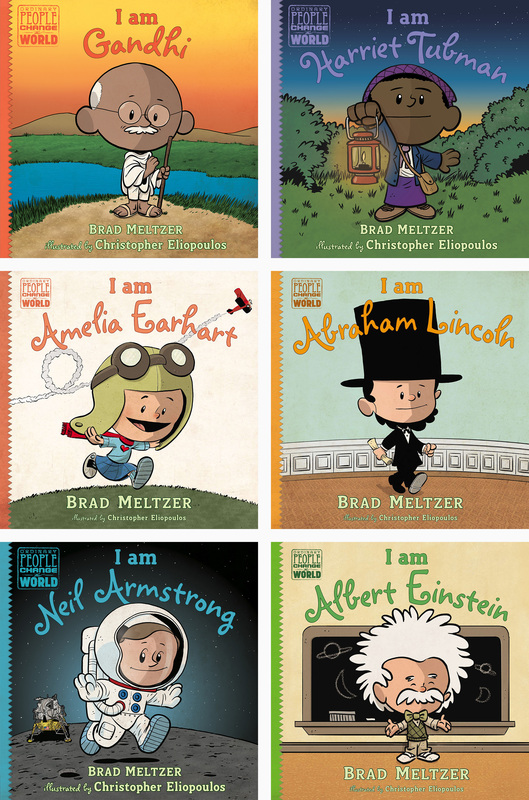 In 2014 Dial Books published “I am Amelia Earhart” and “I am Abraham Lincoln”, the first two books in writer Brad Meltzer’s “Ordinary People Change the World” series of picture book biographies for children, which are illustrated by Eliopoulos. The books were a tremendous success and more books were and are being released. And that’s keeping Chris busy. It’s understandable that he want’s to concentrate on his illustrating and writing career — but unfortunately it means he has less time for other things. His last issue as letterer is Savage Dragon #230. I think I speak for us all when I wish Chris all the best for his future projects (fingers crossed for some more Desperate Times) and who knows — maybe he’ll be back one day… once again. We’ll miss Chris, but good it’s to know he’s creating his own works. Great article. A very nice send off for Chris who has been a big part of the look of Savage Dragon for many years.